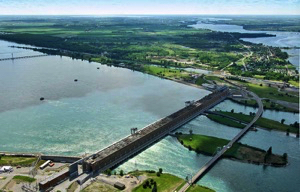 GENERAL INFORMATION Southern Quebec and Ontario, the industrial heartland of Canada, contain Canada's two largest cities, Montreal and Toronto. In this small region, 50 percent of Canadians live and 70 percent of Canada's manufactured goods are produced. Climate is linked to landforms in many ways. The Great Lakes cause the hot humid weather found here in the summer by providing the moisture in the air (precipitation). The St. Lawrence Lowlands is the closest region in Canada to the equator, making the weather mild. There can be 100cm of rain each year from the humidity in the summer. Winter in this region can be very unpredictable. Winters can turn out to be cold, with sticky snow because of the humidity from the Great Lakes. Also when the cold Arctic air interacts with the warm gulf masses, the results can turn very unstable which means lots of precipitation for this region. There can be up to 80 cm of snow each winter and temperatures can drop to minus 30 degrees Celsius. This unpredictability is caused by the landforms and the ocean. Minerals are an important natural resource for this region. Most of the minerals are found within the rocks in the Great Lakes area. The minerals found here include iron ore, zinc, silver, coal, copper and lead. These minerals are dependent on the rocks found in this region. The rich soil in this lowlands region is another natural resource. Scientists believe that this area was once a sea for along period of time. Layer after layer of sediment fell upon the sea floor. Once the sea began to dry up it left behind this very rich fertile soil. This region has the best source of water in Canada because of the St. Lawrence River, Niagara Falls and the Great Lakes. Glaciers retreating, formed the lakes and rivers long ago. As the glaciers retreated, they dug huge holes that were filled by water. This fresh water provides many important industries for this area. Manufacturing is the St. Lawrence, Great Lakes Lowlands biggest industry. 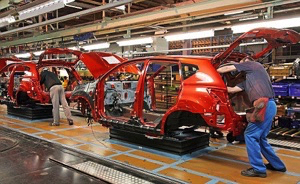 Fifty percent of jobs in this region are related to manufacturing. Manufacturing plants are located in the golden horseshoe. Lots of things are produced here. For example, they manufacture steel, iron-ore, coal and lime stone. People living within this region tend to build manufacturing plants close to the bodies of water, for hydro power (electricity); close to where the minerals are found; close to people for more workers; and on rock which can hold up buildings and heavy machinery. This region provides all of these necessities for successful manufacturing in Canada. Farming is another popular industry here. This region has the 2nd largest area in Canada used for farming because of it's rich soil, flat land and the climate is good (long growing season that is warm and humid). Orchards of apples, peaches, cherries, asparagus, tomatoes and also strawberries can be grown near Niagara Falls area. The Niagara Falls area harvests peaches, cherries and grapes. Southwest Ontario grows soybeans, corn and tobacco. 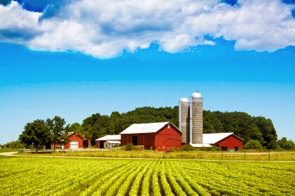 About 70% of the land in the Great Lakes Lowland it is used for crops such as hay, pasture and field grains. 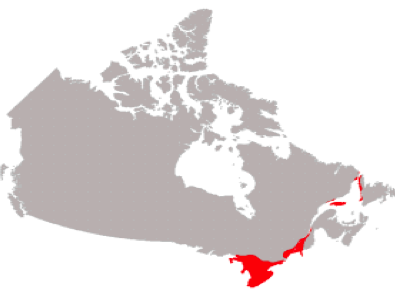 This is a very important region for growing crops in Canada. The large expanses of Lakes Erie and Ontario extend the number of frost-free days, permitting the cultivation of grapes, peaches, pears and other fruits. 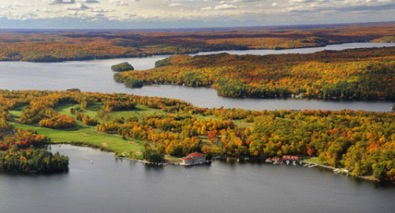 The Great Lakes and St. Lawrence region is sugar maple country. 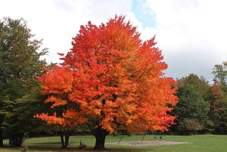 In the autumn, the tree's leaves, Canada's national symbol, are ablaze in red, orange and gold. The sap is collected in spring and evaporated to make maple syrup and sugar, a culinary delicacy first prepared and used by the Aboriginal North American peoples. 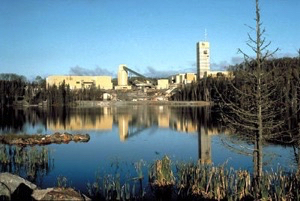 The St. Lawrence lowlands mine iron-ore, zinc, coal, silver, copper and lead. They retrieve the minerals by drilling into the rocks and using machinery. Many jobs are directly and indirectly linked to mining. These are only some of the industries in the St. Lawrence Lowland region and there are many more still. This region also has the greatest concentration of large cities in Canada.